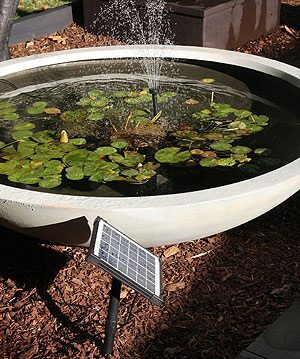 Both in the garden and in courtyards Solar Powered Fountains, pond pumps and water features are increasingly popular. With no running costs for solar pumps, and easy installation its easy to see why you might choose one for a pond pump or fountain pump. The solar pump and panel pictured right will run a small fountain. It does require direct sun to operate. The panel is usually on a 5 -7 cord so it can be positioned away from the pond or fountain and in the sunniest position possible. New efficient and reliable solar powered water pumps, some with battery backup are finding their way onto the market, we provide a guide to these pumps for both water features and home use as well as agricultural solar pumps in Australia. Pumps for running Solar powered water features and solar powered fountains are becoming a real alternative for the home garden. As with other pumps, these pumps come in kits, the are submersible, suitable for a small water feature, have no operating costs and are easy to install. Spray heights vary from 12cm to 2.5m depending on brand and model. With a solar panel located to be north facing you will get the most out of your fountain. Solar fountains can purchased in kit form, complete with panel, pump, cable (the solar panel can be located 4-5m from the fountain) and some even come with interchangeable fountain heads. Using Solar pumps for waterfalls. You will need to determine the height that that the water needs to pumped to (head height) and then the flow rate required to determine the minimum power required to run a waterfall from a solar pump. Solar pumps are used in horticulture to supply water to troughs for livestock. Pumping water from bores requires a reliable and low maintenance system and PV systems (photovoltaic) are the latest technology in this respect. Floating pumps are another recent addition to the methods used in agriculture. The panels are usually located on dry ground and attached to the floating pump. In many cases these are self priming. Solar pumps that will satisfactorily pump from bores are expensive, however in some cases government rebates may be available. Submersible types are also available, and these can pump water from around 200m. Easily installed and economical solar pumps are now widely used in agriculture around the world and are well suited to Australian applications.